I'm back with the second half recap of our recent trip to Italy. If you missed part one, you can find it here. Today I'm revisiting our time in Positano. If you recall from my last post, we ended our stay in Capri with a boat tour. From there we were dropped off at the local marina and then hopped on a ferry that took us directly to Positano. We arrived at the dock and immediately found a porter to help haul our luggage up the mountain to Casa Cosenza, a small bed and breakfast nestled snug in the cliff-side. There were approximately 200 steps to climb to get where we were staying. We soon realized that we would be climbing steps no matter where we were going, as Positano is a cliff-side village located on the Amalfi Coast. Our tiny room with a view. We had a small balcony, perfect for watch the sunrise and set. After we unloaded our things and got settled into our rooms, we were on our way to Le Sirenuse for lunch reservations. This place gets its name from the islands of the Sirens which it overlooks, and let me tell you, the view is gorgeous! We had an elegant lunch on the third-floor terrace. To be completely transparent, this probably wasn’t the best choices of places to go after traveling and trying to get settled. The boys wanted something casual and inexpensive and this was neither of those things. But I’m glad we went because the scenery was worth it. I think we may have ordered a caprese salad at every restaurant we dined. I had the pasta special of the day which included lots of mushrooms! After lunch, we did a little exploring, popping in and out of various local shops nestled in the hill. I had my heart set on getting a pair of leather sandals made and that’s just what I did. Having a small foot makes buying shoes quite challenging but having them made specifically to fit my foot was a win! I’m kicking myself (no pun intended) for not buying more. We stopped by the black pebble beach to catch the last rays of the day. For dinner, we decided to walk around and find a random spot that looked good. 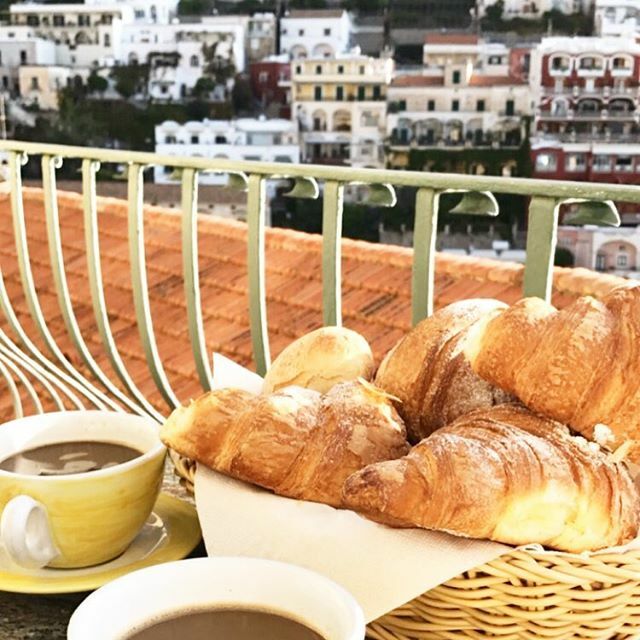 We ended up a Collina Positano Bakery, a small cozy bakery open for breakfast, lunch and dinner, offering of variety of things including, pizza, pasta, pastries, beer, wine and coffee and more. Of course, I went for the pizza and it was delicious. We ended the evening at an intereseting restaurant and bar located inside what use to be a cave. We just happen to stumble across the place on the way back to our rooms. The next day we took our time getting ready and set out to find a lunch spot. You’ll notice that we decided to randomly choose places to dine per the request of the guys. 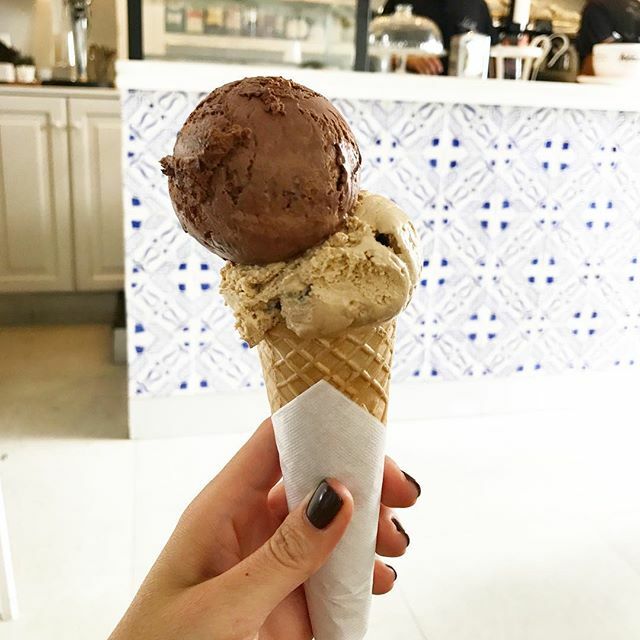 And I’m glad we did because we found a great spot for sandwiches and gelato called Li Galli Bistro. My sandwich was so simple yet so flavorful and fresh. 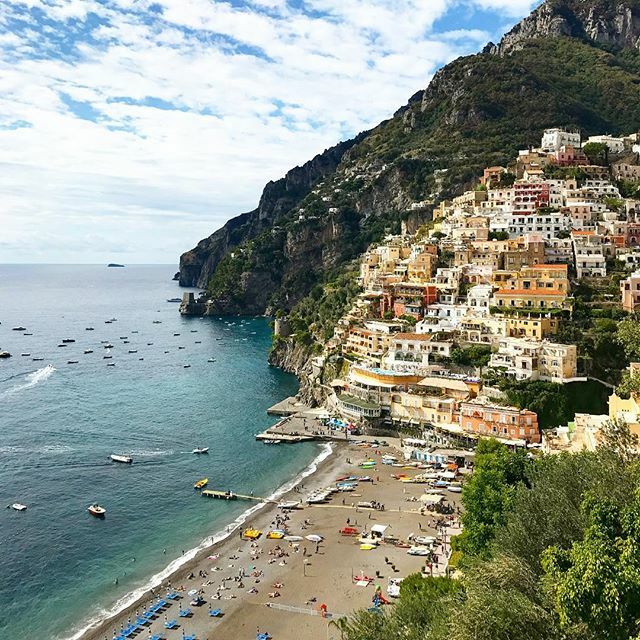 Lounging on the beach and soaking up the Italian coast was next on our radar. The weather wasn’t cooperating with us so there wasn’t much sun but it was nice to kick our feet up and relax for a bit. We had an afternoon pick me up at one of the cafés on the beach. How cute are these cups and saucers? They were actually available for purchase but we were told that we had to come back the next day to get them. Unfortunately, we never made it back. Our last dinner was at Bucca di Bacco. The mussels and the pesto pasta dish were both so tasty. The bed and breakfast where we stayed offers breakfast prepared fresh and is served outside on your balcony for just 10 Euros per person. We decided to do that on our last morning there so we could take our time packing and not be in a rush. Breakfast included fresh croissants (the size of my head), bread, orange juice, butter, marmalade, coffee, milk or tea. It was a nice send off. We packed our things and said goodbye to our little bed and breakfast and hit the road. We left early so we could go explore Pompeii before we made our way Tuscany. I’m sure most of you have heard of Pompeii, but for those of you who haven’t it’s an archaeological site in southern Italy’s Campania region that was once a thriving and sophisticated Roman city. It was buried under meters of ash and pumice after the catastrophic eruption of Mount Vesuvius in 79 A.D. The preserved site features excavated ruins of streets and houses that visitors can freely explore. It was so cool to walk through the ruins. You could feel the history and just imagine what the streets looked like before they were destroyed. We opted to get a tour guide when we arrived, and I’m glad we did. The site is huge and overwhelming so it was really helpful to have someone point us in the right direction, especially since we had limited time. We only had just a few hours to explore before we had to head to the train station. If you’re ever visiting, I recommend planning for a few hours if you want to see most of it. I don’t think we even saw half of what there was but we thoroughly enjoyed our tour. Plaster casts of Pompeii victims’ bodies provide a chilling look at their last moments before being buried in ashes.